Released in mid-2014, Cruel Poker sticks out like a sore thumb because of the kind of gambling services it offers. There are several Bitcoin poker platforms in the market nowadays, but this website will surely become the go-to brand for those who fancy a game of Chinese poker. This Bitcoin gambling website is marketed as the ultimate software designed for its special kind of online poker betting. What makes this all the more appealing is that it is very open to the possibility of integrating other cryptocurrencies like Dogecoin and Litecoin into its system that currently runs on Bitcoin only. 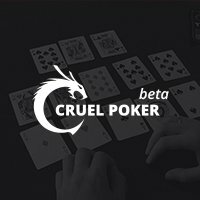 With the use of the digital currency, Cruel Poker has not only reach a handful of Chinese poker enthusiasts, but it also manages to extend its reach to various cities and regions, inviting old and potential players of Bitcoin poker. Therefore, anyone can experience wagering on this type of poker in the comfort of their home. Although this platform is only available for download on PCs as of present, mobile Bitcoin casino bettors will soon find this brand fully functioning on their smartphones and tablets once its mobile optimization gets 100% developed. Therefore, more players will be able to play Open Face Chinese Poker, a variant of the regular Chinese Poker game, and Pineapple Open Face Chinese Poker, which is a variant of Open Face Chinese Poker. So far, these two are the only low and high-stake cash games available in this Bitcoin poker room; however, tournaments and sit-n-gos will soon be joining the list of offered services. Therefore, if you find the two games quite inadequate for your poker betting style, simply bear in mind that Cruel Poker can deliver so much more. Regardless, the stakes here can be as low as 0.05 mBTC while the rake is normally at 3% or at least 0.01 mBTC for the two cash games. Moreover, you are even allowed to play as many tables as you wish at the same time; thanks to the multitabling feature added to this brand. Another aspect that is desirable in this Bitcoin gambling platform is its payment system. Given that it purely runs on the Bitcoin technology, the transactions here will absolutely make the experience favorable. Depositing funds will only need one network confirmation, so expect to be able to begin playing Chinese poker within a few minutes. Similarly, cashing out should be instant; otherwise, the payouts will be delivered to your Bitcoin wallet address in less than an hour. Furthermore, this platform hosts some promotions like its bonus, which assures you of a 100% money back by simply depositing up to 1 BTC. Rakeback and VIP system will also be unveiled soon. Indeed, Cruel Poker may still have several aspects that need to be finalized, but this Bitcoin poker website has the core components that are responsible for a remarkable online gambling using the digital currency. As soon as all services and features are polished, this brand may simply be the website you will frequently visit.